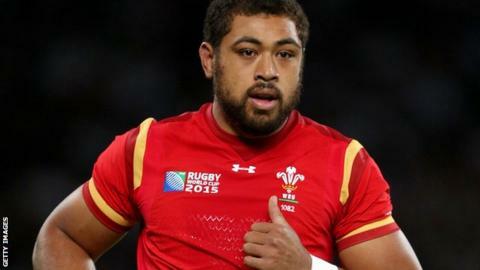 Wales coach Warren Gatland has blocked Taulupe Faletau's proposed move from Newport Gwent Dragons to Bath. The Dragons had sought to release the 24-year-old forward, whose contract runs out in the summer of 2016. Under the funding agreement for Welsh domestic rugby, Gatland has to sanction international players moving outside Wales. A Welsh Rugby Union statement said they were committed to keeping the best players in the country. The Dragons, meanwhile, said the decision was "disappointing". WRU chief executive Martyn Phillips said: "Although there are circumstances under which moves out of Wales by experienced players can be sanctioned, Taulupe's status as a player and importance as a role model means we would like him to be playing his rugby here." The number of players Gatland is allowed to select for the national team from outside Wales is limited by a funding deal with the regions called the Rugby Services Agreement (RSA). The terms of the agreement stipulate that two 'wildcards' can be selected from outside Wales, with the ruling applying only to players who move or negotiate new contracts after the signing of the RSA in August 2014. Currently, only Jamie Roberts (Harlequins), Rhys Priestland (Bath) and Adam Jones (Harlequins) fall into that category. Dragons chief executive Stuart Davies - a former Wales captain - explained it had been a complicated process. "This has been a difficult and sensitive rugby matter, in which the needs and wishes of a player, a region, the wider game in Wales and the national side have all been part of a rather challenging conundrum," he said. "At the heart of it of course is Taulupe, who has been loyal to and is very happy at the Dragons. "Having become aware however of possible interest in him from an English club, he formally requested permission to speak to them, which we granted, with a view to establishing what was best for the player and indeed the region." Faletau has played all his senior rugby at Rodney Parade, but was expected to move to the Premiership. A statement from the Dragons suggests that Priestland's transfer to the Recreation Ground and subsequent announcement by Bath coach Mike Ford that the Wales fly-half was taking an 18-month break from international rugby had an impact on the Faletau decision. "For this particular scenario, release of Taulupe from his contract would have required the national head coach's permission, and the 'wildcard' provision within the WRU senior selection policy was an important factor in this regard," added Davies. "As such, upon Rhys Priestland's reported break from international rugby, the matter was revisited. "It was always going to be painful to lose Taulupe, given what we're trying to build here at the Dragons, but our decision to pursue the transfer option was a very measured one, having regard to a number of considerations. "Whilst we fully respect the aspirations of the RSA, naturally it is disappointing on this occasion that we have not been able to act independently in the best interests of the region, or to receive the required support in achieving our preferred outcome. "That said, Taulupe will now be part of our preparations for the weekend and we look forward to welcoming one of the world's best number eights back into the fold. I have no doubt that his commitment to the Dragons will be as unfaltering as always."